Michael Gough played soprano for Troopers for three years, then became drum major this year. He'll be aging out in 2004. 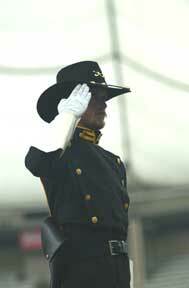 ^Michael says, "I think Troopers are regarded as 'America's corps' because of out patriotic themes over the years. That tradition is continuing even though we're pushing into the future, adding new things that make us innovative again.^"The 'Sunburst' was first curve seen on the field. We do the original 'Sunburst' before the show begins, as it had been done in the past. It's put together with the rifles tossing in a circle with me in the middle, a move known for decades as the 'Suicide.' "For the members, the traditions have stayed the same. But for the audience, it's obvious that the traditions are coming back on the field. There are hints of old stuff during the show, such as the section when we play 'Battle Hymn' backfield in the closer and 'When Johnny Comes Marching Home' appears in the ballad. It reflects on the history of corps. "I brought back the old salute from as long ago as I could find videos. It's very simple, not too flashy, and it fits the uniform. "We actually changed our uniform this year for a cleaner look. We wanted to stand out more, so we went from gray to black pants and removed the stripe. It's different, but it's still Troopers. "The motto of Troopers is 'Honor, Loyalty, Dedication.' We may not be in the top five anymore, and we may not have a ring, but to be part of a corps that has done so much for the activity is a great feeling...to carry one what has gone before. "I think people should be paying attention. We're starting to step things up. This is a turning point in where we're going. We've got a good future."